On my way back to Toronto after spending time with my mom and dad in Thornbury Ontario. 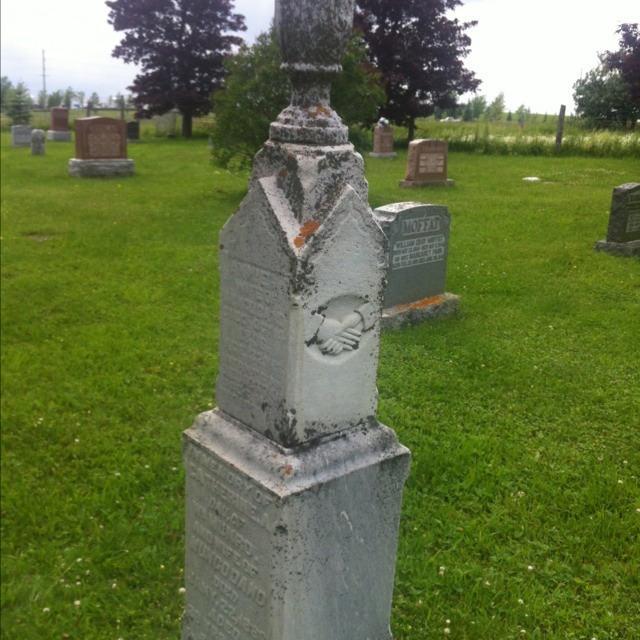 If I have time I like to stop by the grave of my great great grandparents Mungo Dand and Catherine Ann Munro who are buried in the cemetery of Burns Presbyterian Church in Feversham Ontario. My great great great grandparents William and Marion Dand are also buried here, but their graves are unmarked. These two are a tragic story. Catherine died in childbirth delivering her fifth child who himself died two months and 20 days later. Mungo remarried but lost his second wife too and stricken with grief he shot himself in the head with a shotgun in 1902.
Who learned in youth her God to fear. I get the sense they were a pious family and his suicide must have been a shock. Subsequently in 1918 his son William Gordon Dand died tragically as one of the first flu victims in Regina, Sasaktchewan. I have visited his grave too in Regina in the flu section of the city cemetery. I love connecting with my ancestors. What if we can never leave? Thank you for sharing this, Chris. Yes, I love connecting with my ancestors, too: close and distant, near and far. My Dad would always take us to graves of Grandparents and Great Grandparents. Often, when on family holidays, Dad would take us to cemeteries for the sheer interest, beauty and reverence of such places: history, sculpture,and a sense of the sacred. Cemeteries connect us with cycles of life, ancestry, earth and place. Where my ancestors are buried connects me to the land that is my heritage: Gippsland and Western district here in Victoria Australia; and Clonakilty Co Cork and Knocklofty Co Tipperary in Ireland. When I went to Ireland, land of my ancestors, I felt such a connection: it was like my DNA danced. My Dad passed 4 years ago. I love to visit his grave in Brighton, Melbourne. It is a beautiful cemetery and I love to spend time with Dad, pray,chat and feel his presence. I was there just a few days ago, and gave him 2 dozen roses, his favourite flowers. My paternal grandparents and an uncle are also buried in Brighton cemetery, and also some significant Australian Artists, such as Arthur Boyd and Frederick McCubbin, whose work I love. So it is a place of my personal history and our broader cultural history. When I lived in Sydney, I would picnic at Clovelly Cemetery which is on a cliff-top, and I would sketch the sculptures of angels.